Support groups are beneficial for caregivers in countless ways. Not only do they pull you out of isolation and give you a break from your caregiving duties, but they give you the opportunity to talk to others who are in similar situations and understand what you do on a daily basis. Having validation from others helps you understand that you are not alone and that your feelings and concerns are normal. Attending support groups also is a great way to get advice, learn more about Alzheimer’s, and gain access to other resources. You also have the chance to share your frustrations and relieve some stress. And, you’ll appreciate learning from other’s experiences in caring for someone with the disease. 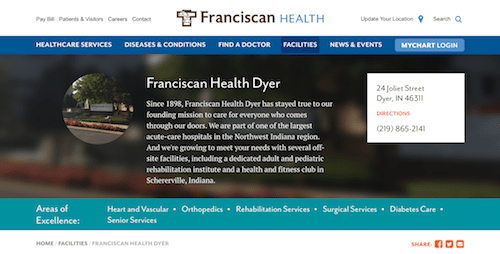 But, we understand the demands of providing care for a loved one with Alzheimer’s is so taxing that you may not have the time to find a support group in your area of Indiana. To help you choose a group that fits into your schedule and matches your needs, we have rounded up 50 of the best Alzheimer’s support groups in the state. The following support groups meet consistently and are led by experienced medical professionals, caregivers, social workers, and counselors who provide helpful information and create a confidential environment for participants. We also have included a few educational classes and groups in case you are new to Alzheimer’s caregiving. To make your search for the right Alzheimer’s support group in Indiana even easier, we have listed our top picks in alphabetical order; therefore, they are not ranked or rated by value or importance. 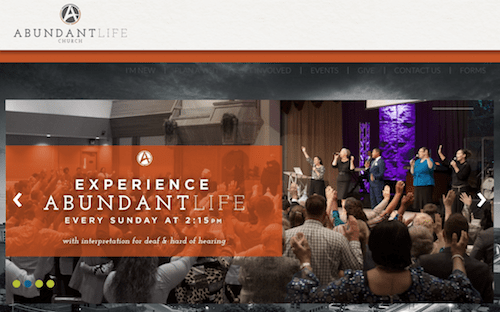 Abundant Life Church is a diverse, multicultural community that ministers to the community in several ways. 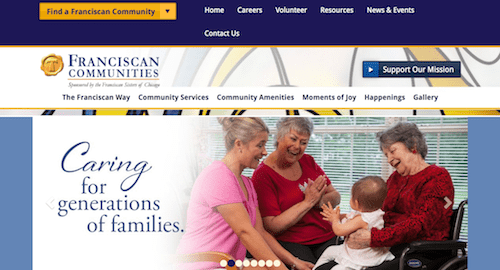 The church also hosts an Alzheimer’s caregiver support group, which is affiliated with the Greater Indiana Chapter of the Alzheimer’s Association, once a month in room 141. Please note, attendees should use entrance 4. The Adams Health Network strives to create strong relationships with the community. As such, they host events for community members and employees, such as Weight Watchers meetings, health coaching services, and fitness classes. They also host an Alzheimer’s caregiver support group each month at Adams Memorial Hospital, in the Decatur Classroom. The group is intended to ease the burden caregivers feel while providing care to patients with Alzheimer’s or dementia, and it meets in a loving, confidential setting. The Northwest Indiana Office of the Greater Indiana Chapter of the Alzheimer’s Association is located at 8679 Connecticut Street. They host an Alzheimer’s caregiver support group the third Wednesday of each month in Suite D. For more information, please contact 1-800-272-3900. Held at the Viking Chili Bowl at 105 E US Highway 30 (Morthland Drive), the Caregiving Men’s Breakfast Group is a support group for male caregivers. The breakfast meeting is facilitated by John Gorski. Please contact John at 219-508-7829 for more information about this Alzheimer’s caregiver support group for men. 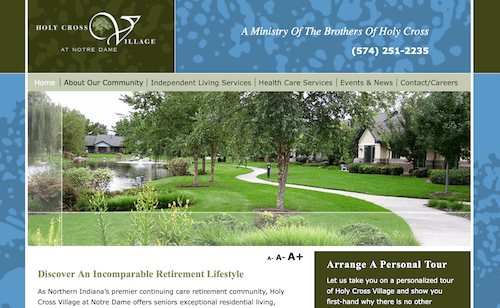 Andre Place at Holy Cross Village at Notre Dame is part of a premier retirement living community in the South Bend, Indiana area. They host an Alzheimer’s and dementia support group for caregivers once a month. Facilitated by Laurie McFadden, the group is for family members and friends who care for loved ones with the disease or a related dementia. For more information about this confidential support group, please contact Laurie at 574-251-3246. Brentwood at La Porte is a senior living community located 10 minutes south of Lake Michigan on beautifully landscaped grounds. Their Alzheimer’s caregiver support group is facilitated by Dorothy White and welcomes friends and family members of people living with Alzheimer’s disease or a related dementia. 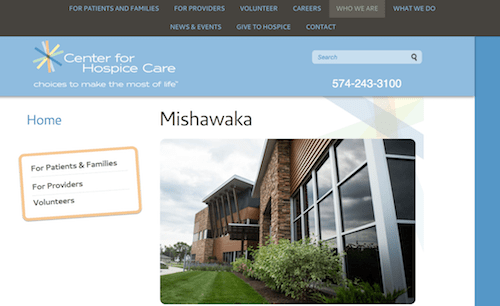 The Caregiver Support Group for Adult Children of Parents with Dementia is held at the Center for Hospice Care’s Mishawaka Campus, which sits between Lincolnway and Mishawaka Avenue. To attend the support group, enter the campus off of Cedar Street, using the Comfort Place of Madison Street. Held monthly, the support group is facilitated by Linda Jacobs and Lisa Gartee. For more information, please contact Alzheimer’s & Dementia Services at 574-232-4121. 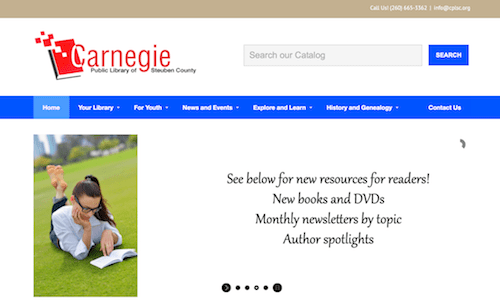 The Carnegie Public Library of Steuben County is the site of an Alzheimer’s caregiver support group that meets the first Wednesday of each month from 1:30 – 2:30 pm. 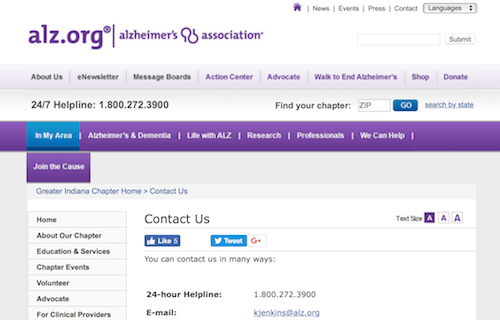 The group meets in the A meeting room on the second floor of the library and is affiliated with the Greater Indiana Chapter of the Alzheimer’s Association. 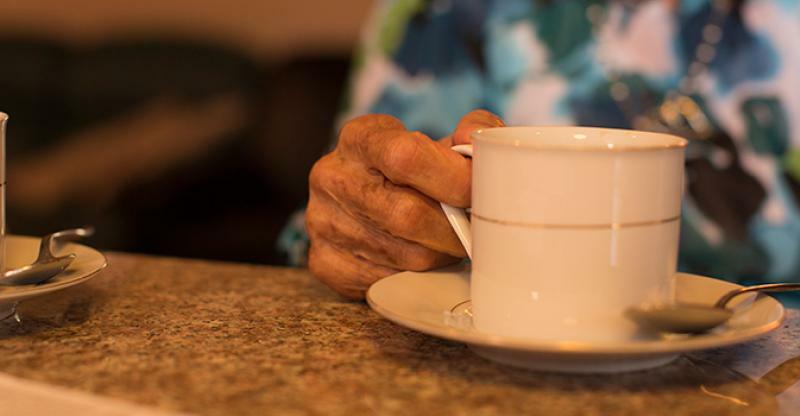 Caregivers of people with Alzheimer’s in the Lafayette, Indiana, area have the option of attending a support group at The Center at Jenks Rest once a month on a Tuesday morning or a Thursday evening. The support group is open to the public and welcomes walk-ins. Anyone who provides support to people diagnosed with Alzheimer’s disease may attend this support group. 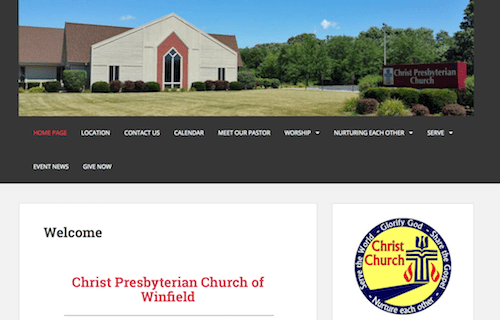 Christ Presbyterian Church of Winfield is located at 7416 East 109th Avenue. They host a support group for caregivers of loved ones with Alzheimer’s or related dementia the second Thursday of each month at 6 pm. Please contact Kathleen Luken for more information at 219-728-1106 about this support group. 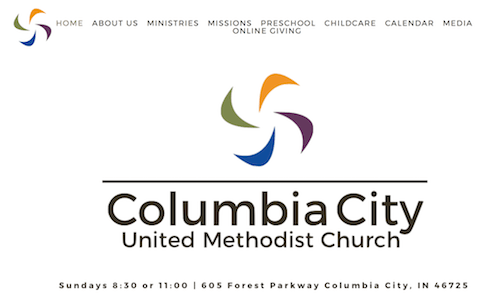 The Columbia City United Methodist Church is located at 605 Forest Parkway in Columbia City, Indiana. It is the site of an Alzheimer’s caregiver support group that meets one Monday a month at 6:30 pm. The group is affiliated with the Greater Indiana Chapter of the Alzheimer’s Association. Community Health Network is a leader in providing convenient access to exceptional healthcare in central Indiana. 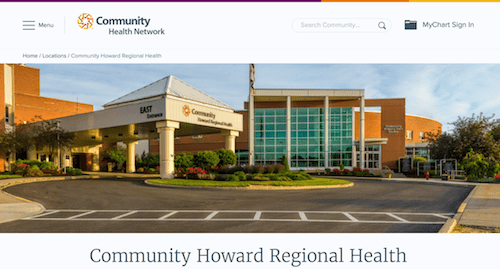 Community Howard Regional Health, a member of the network, is located on South Lafountain Street in Kokomo. Community Howard Regional is the site of an Alzheimer’s caregiver support group that meets one Thursday evening a month in the community room off the east lobby. 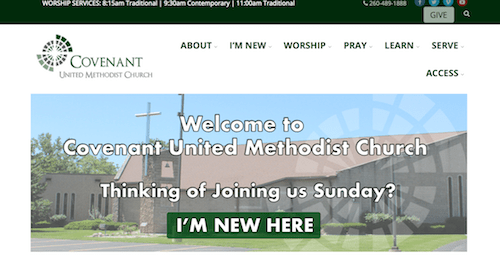 Covenant United Methodist Church of Fort Wayne, located at 10001 Coldwater Road, is on a mission to build healthy families in the community by transforming relationships through God. The church is the meeting site of an Alzheimer’s caregiver support group that meets the second Monday of each month at 10 am. The group is affiliated with the Greater Indiana Chapter of the Alzheimer’s Association. The Morningview Assisted Living Residences on North Niles Avenue in South Bend host a monthly Dinner and Dementia Education Program Series for Caregivers. The free dinner and series covers various topics that are helpful for people caring for loved ones with dementia or Alzheimer’s. To register to attend, please contact Roger Garmendia, executive director of Morningview Assisted Living Residences, at 574-246-4123. 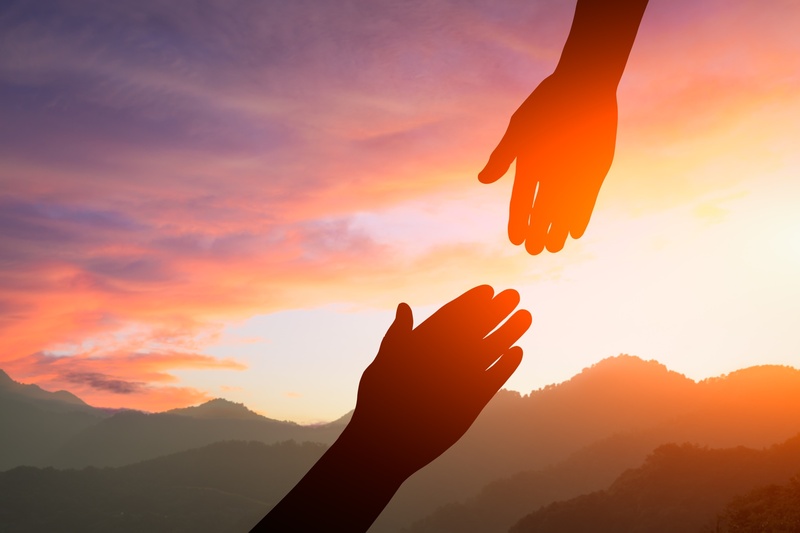 Faith Community Ministries addresses community needs with compassion, truth, and hope. 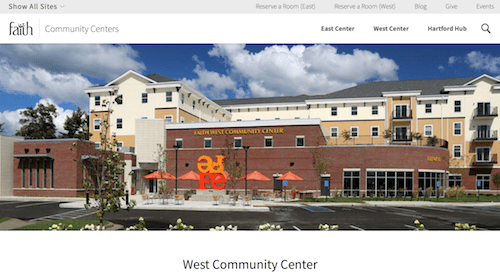 The Faith West Community Center helps the ministry meet those needs, including providing a space for an Alzheimer’s caregiver support group. The group, which is affiliated with the Greater Indiana Chapter of the Alzheimer’s Association, meets once a month in student study rooms one and two. 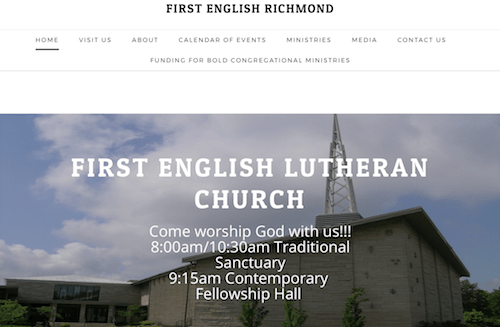 The First English Lutheran Church of Richmond, Indiana, provides a space for an Alzheimer’s support group twice a month. The group is geared toward friends, family members, and caregivers to people with dementia, including Alzheimer’s. Walk-ins are welcome, but you may contact the group director at 765-935-6005 for more information. 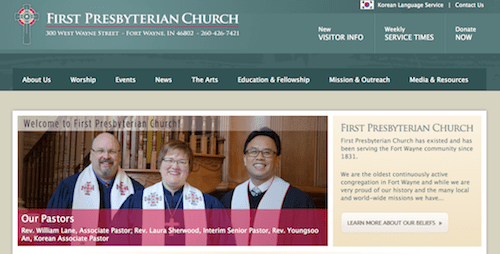 The First Presbyterian Church of Fort Wayne, which is rooted and reaching in God’s word and offers a Korean language service, is located at 300 West Wayne Street. The church also provides a meeting space for an Alzheimer’s caregiver support group once a month. Family members who provide care to loved ones with Alzheimer’s are welcome to attend the group, which is affiliated with the Greater Indiana Chapter of the Alzheimer’s Association. 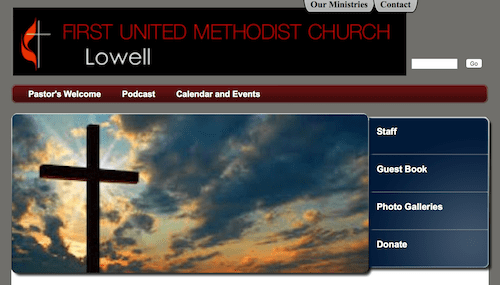 The First United Methodist Church of Lowell invests a great deal in ministry in the town and around the world. It also will begin providing a space for an Alzheimer’s caregiver support group the fourth Tuesday of each month, beginning in October 2017. The support group is affiliated with the Greater Indiana Chapter of the Alzheimer’s Association. The Resurrection Lutheran Church in Fort Wayne, Indiana, hosts the Memory Café, an Alzheimer’s support group for people in the early to middle stages of memory loss and their caregivers. This comfortable, engaging group brings people struggling with the effects of Alzheimer’s and dementia together for socialization, learning, and fun. 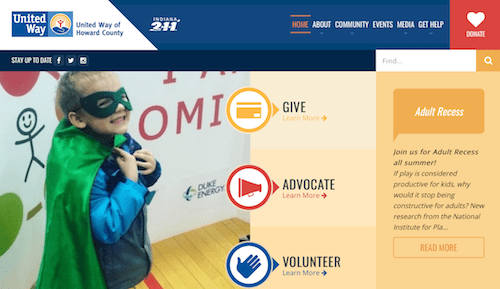 Please note, monthly registration is required by calling 1-800-272-3900 or 260-420-5547. Facilitated by Jill Barr, the Alzheimer’s caregiver support group held at the Franciscan Communities Adult Day Center welcomes family members and friends who care for people living with the disease or a related dementia. Please note, all issues and discussions raised during the support group are confidential. The Franciscan Dyer (St. Margaret Health) Alzheimer’s caregiver support group is facilitated by James and Pat Koeling. The support group meets in the Blessed Mother conference room to the left of the west entrance, so attendees should enter the building on Joliet Street using that entrance. Please note, this support group is appropriate for friends, family members, or caregivers of anyone living with a chronic disease including Alzheimer’s or dementia. 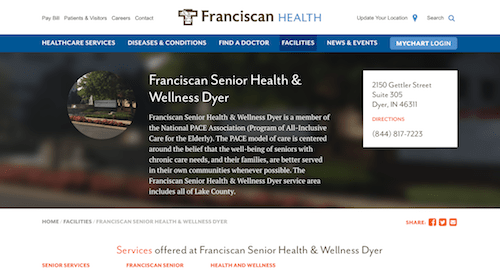 The Franciscan Senior Health & Wellness Dyer serves all of Lake County and is a member of the National Program of All-Inclusive Care for the Elderly (PACE) Association. Their Alzheimer’s caregiver support group meets on the third floor of the Dyer Medical Pavilion South, located at 2150 Gettler Street, in suite 305. The group also is affiliated with the Greater Indiana Chapter of the Alzheimer’s Association. 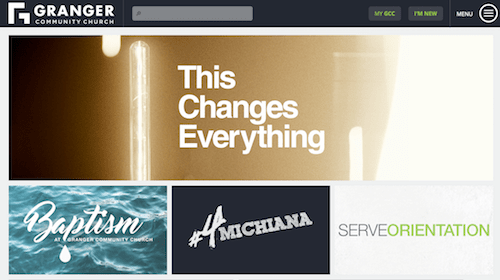 The Granger Community Church strives to help people take their next steps toward Christ together, and they offer several groups and core classes to help members do so. They also provide a space for an Alzheimer’s caregiver support group to meet once a month. This support group is affiliated with the Greater Indiana Chapter of the Alzheimer’s Association. 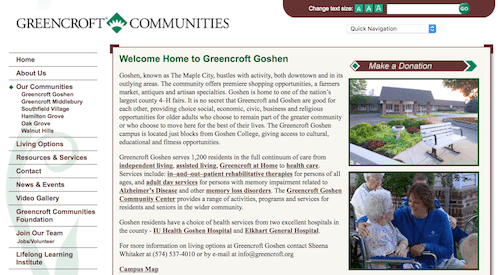 Greencroft Goshen is a senior living community of 1,200 residents who enjoy a full continuum of care from independent living to health care to adult day services for people with memory loss due to Alzheimer’s disease and other memory loss disorders. The Greencroft Community Center also offers a variety of activities, programs, and services for residents and seniors in Goshen, including their Alzheimer’s caregiver support group. The group is facilitated by Brenda Buller and Darlene Lidy and welcomes family members and friends who provide care for loved ones living with the disease or a related dementia. For more information, please contact Brenda at 574-875-8271 or Darlene at 574-522-2368. Hartsfield Village, a continuing care retirement community, offers solutions for the full continuum of life and encourages successful aging. The village also offers an Alzheimer’s caregiver support group the second Wednesday of each month, complete with free dare care for older adults while the caregiver attends the group. Please call facilitator Jill Keilman at 219-934-0750, ext. 200 for more information or to arrange day care for your care recipient. 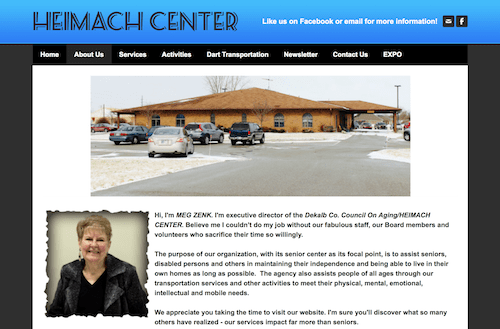 The DeKalb County Council on Aging and Heimach Senior Activity Center serve as the resource hub for seniors in Auburn and the surrounding areas. In fact, the agency assists people through transportation services and activities designed to address their physical, mental, emotional, intellectual, and mobile needs. The center also hosts a support group for caregivers of people with Alzheimer’s disease or a related dementia the third Thursday of each month at 2 pm. 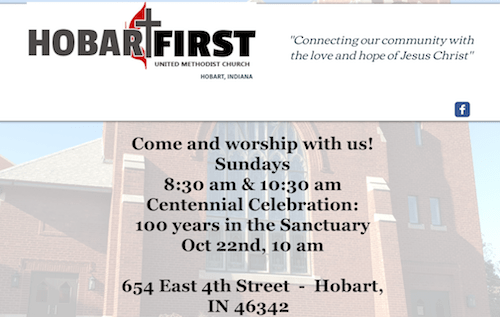 The Hobart First United Methodist Church has been sharing love and hope throughout the community for more than 100 years. They also support the community by providing a space for a support group for caregivers of loved ones with Alzheimer’s or a related dementia. For more information about the group, contact Kathleen Luken at 219-728-1106. Indiana University Health is Indiana’s most comprehensive academic medical center, and one of the busiest. 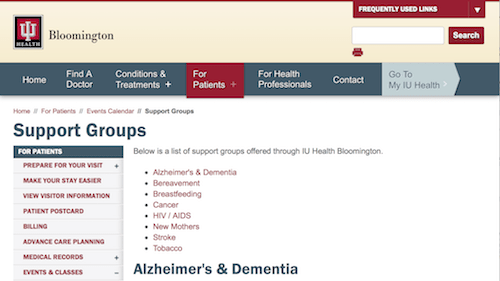 Specifically, IU Health Bloomington is a bustling medical center that offers more than 12 support groups throughout the community, including the Care Circle Support Group for Spouse Caregivers. The group welcomes spouses and partners of people living with Alzheimer’s or dementia twice a month and does not require registration. If you’d like more information, contact 812-353-9299. Please note, the group meets in the IU Health Community Health Conference Room at 333 East Miller Drive in Bloomington. 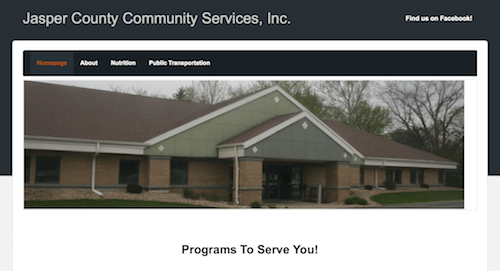 A not-for-profit organized to serve the community, Jasper County Community Services, Inc. provides programs and services in three center locations. One such service is offering a caregiver support group for family members and friends who care for individuals with Alzheimer’s disease or a related dementia. The group meets the last Tuesday of the month at 4 pm at 967 East Leopold Street in Rensselaer. Journey Senior Living of Merrillville is the only standalone memory care unit in northwest Indiana. Fully licensed and accredited, Journey Senior Living offers a range of service and amenities to residents of their senior living center. They also host a Dinner & Dementia Education Series, which is free of charge for caregivers of loved ones with Alzheimer’s or a related dementia. Attendees receive information to help manage caregiving tasks and learn more about dementia. Please note, you are required to register at least one week prior to attending the Dinner & Dementia Education Series at Journey Senior Living. 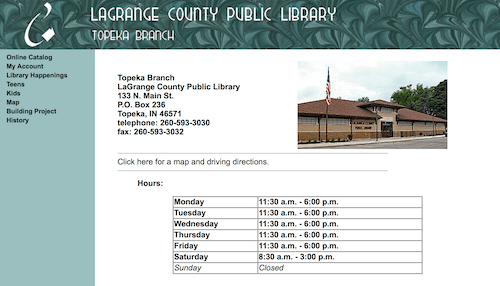 The LaGrange County Public Library has two branches, one in Shipshewana and one in Topeka, and a bookmobile to serve all of LaGrange County. Their Topeka Branch is the site of a caregiver support group for individuals providing care for loved ones with Alzheimer’s disease or a related dementia. The group meets once a month at the library, located at 133 North Main Street, and is affiliated with the Greater Indiana Chapter of the Alzheimer’s Association. 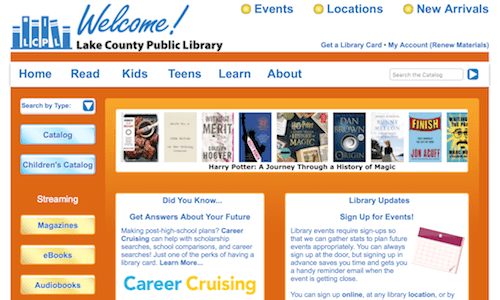 The Lake County Public Library is Indiana’s third-largest library and serves 13 communities of northwest Indiana at nine locations. Its Merrillville location, at 1919 West 81st Avenue (US30), hosts monthly dementia education classes that cover various dementia-related topics and host speakers. Residences at Deer Creek provides lunch from 11:30 until noon, and the class runs from noon until 1:30 pm. Please note, a repeating monthly class, Orientation to Alzheimer’s & Dementia, also is held from 10 am until 11:30 am; it is intended for first-time attendees or those who are new to providing care to people living with the disease. To register, contact Alzheimer’s & Dementia Services at 1-888-303-1080. 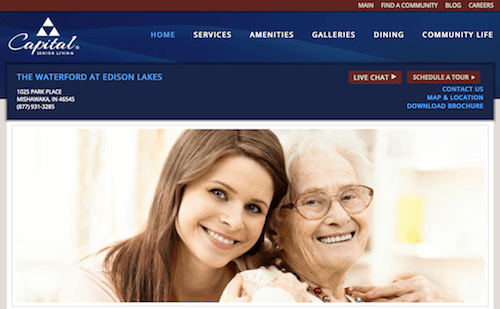 The Waterford at Edison Lakes is an independent and assisted living community in Mishawaka with a new building and immaculate grounds. The Waterford also hosts a lunch and learn group for caregivers, and several of the sessions are geared toward dementia and Alzheimer’s. Both lunch and the education program are free of charge, but caregivers who plan to attend should contact Leah Kelly Schrock at REAL Services by calling 574-284-7132 or 1-800-552-7923, extension 7132 to register ahead of time. 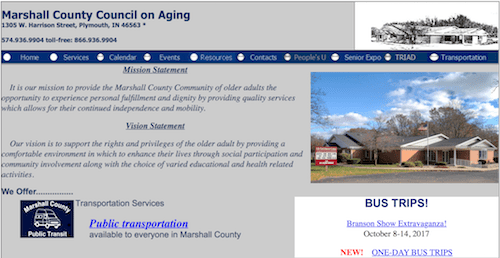 The Marshall County Council on Aging offers a support group for people affected by Alzheimer’s disease. The group is geared toward caregivers of people with the disease or a related dementia and meets on the third Tuesday of every month at 10 am. For more information or to inquire about registering to attend the group, call 574-936-9904 or 1-866-936-9904. 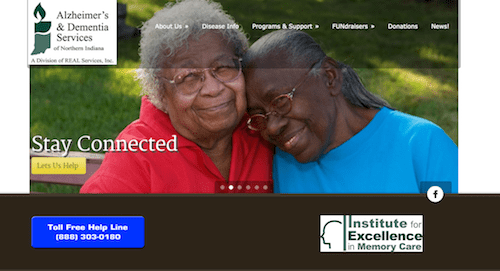 Alzheimer’s & Dementia Services of Northern Indiana provides education and support for families, caregivers, and professionals affected by Alzheimer’s disease and related dementia. They offer a monthly dementia education class/support group at their office on 922 East Colfax Avenue in South Bend. Kristina Fuller, MA, LPC, ATR, program specialist, is the facilitator of this free monthly group that welcomes family caregivers and friends of those with Alzheimer’s or dementia. Please call Alzheimer’s & Dementia Services at 574-232-4121 or 1-888-303-0180 to register. The United Way of Howard County uses compassion and cooperation to provide leadership in solving the community’s social needs. One new way in which the United Way of Howard County is helping the community is by hosting a caregiver support group for caregivers of people with Alzheimer’s or related dementia. The group begins in the first week of October 2017 at 210 West Walnut Street. 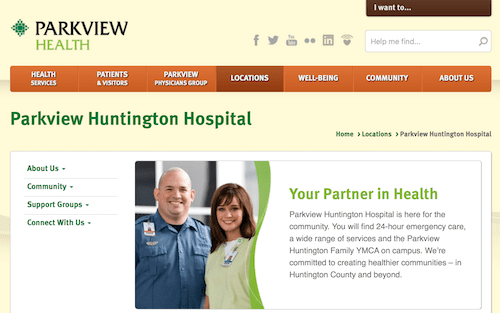 Parkview Health is a not-for-profit system of eight hospitals with more than 350 physicians. They offer a host of support groups for the community, including a support group for caregivers of people with Alzheimer’s disease and related dementia. Meetings are held the second Wednesday of every month at 10:30 am at Parkview Hospital on Stults Road. 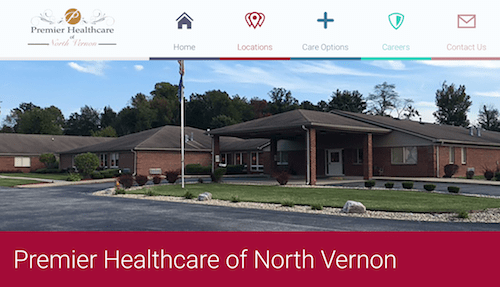 Premier Healthcare of North Vernon is the only skilled nursing facility in Jennings County. Premier offers a Secured Memory Neighborhood and hosts a monthly Alzheimer’s support group to help caregivers and family members handle the effects of the disease on their loved ones. The group is free of charge and does not require registration for attendance. Please note, the group is held in the library room. Active in missionary projects, Risen Savior Lutheran Church provides space for an Alzheimer’s caregiver support group the second Thursday of every month at 6:30 pm. Friends and family members attend the group to get information and support from others who understand the effects of the disease on their loved one. 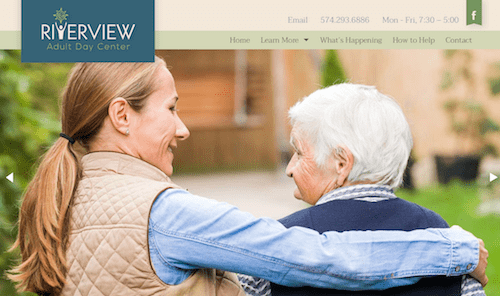 Riverview Adult Day Center (ADC) provides unique, affordable day care service for seniors with special needs and respite for caregivers. Seniors enjoy activities and fun with staff members while caregivers get respite during daytime hours so they can relax, keep their job, or take care of their own needs. Riverview ADC also hosts a monthly caregiver support group on the third Tuesday of every month at 10 am. Day care service for older adults is available free of charge while caregivers attend the group. To make arrangements for day care service or to get more information about the support group, contact Barbara Brockhoff, facilitator, at 574-293-6886. 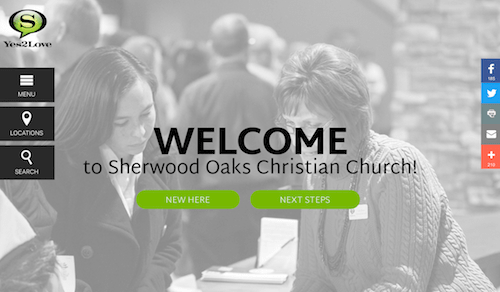 In conjunction with Indiana University Health, Bloomington, Sherwood Oaks Christian Church offers a support group to people with Alzheimer’s disease or dementia and their caregivers. The group is open to the public and meets twice a month, on the second and fourth Monday of each month, from 1 – 2:30 pm. No registration is necessary for attendance, but you can call 812-353-9299 for more information. Pesto’s Italian Restaurant on Calumet Avenue in Valparaiso is the location of the St. Agnes Alzheimer’s caregiver support group. Facilitated by Barb Kubiszak and Terri Dickus, the group is open to the public and is geared toward family members and friends who provide care for loved ones with Alzheimer’s or a related dementia. The issues discussed at this support group are confidential. For more information, please call 219-477-5433. 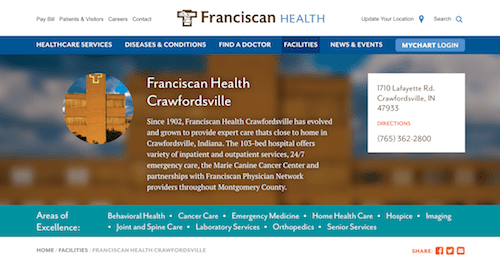 Formerly known as St. Elizabeth Hospital, Franciscan Health Crawfordsville is located at 1710 Lafayette Road. The medical center hosts an Alzheimer’s caregiver support group on the second Tuesday of every month at 11:30 am and is free of charge and open to the public. Please note, the group meets in the classrooms next to the cafeteria. 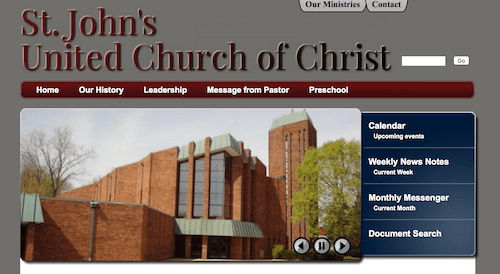 Dedicated to deepening faith through fellowship, St. John’s United Church of Christ in Michigan City, Indiana, serves as the meeting place for caregivers of those with Alzheimer’s disease or related dementia. The group meets the second Thursday of every month at 6:30 pm; please note, however, the group does not meet in November. 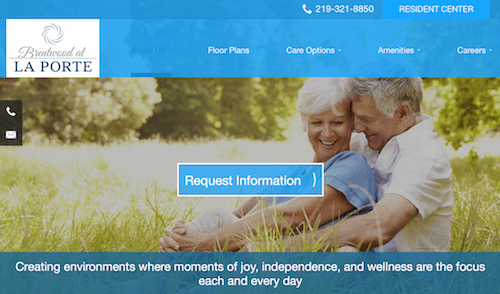 Trinity Health Senior Communities is a non-profit National Health Ministry of Trinity Health that serves seniors through care and housing options. St. Paul’s Life Plan Community in South Bend, Indiana, a member of Trinity Health, gives seniors the opportunity to be active and lead fulfilling lives. St. Paul’s also hosts a monthly Alzheimer’s caregiver support group once a month in the sanctuary. The group, which begins at 6:15 pm the second Thursday of each month, is facilitated by Carole McCollester and Dusty Snow. For more information, contact Carole at 574-284-9055. 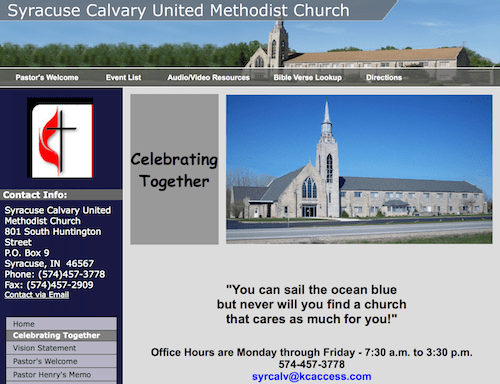 The Syracuse Calvary United Methodist Church offers worship services, small groups, and other areas of outreach and ministry. They also provide a space for an Alzheimer’s caregiver support group to meet on the fourth Thursday of each month at 2 pm. The group is open to the public and free of charge; they just ask that you keep all group discussions confidential. 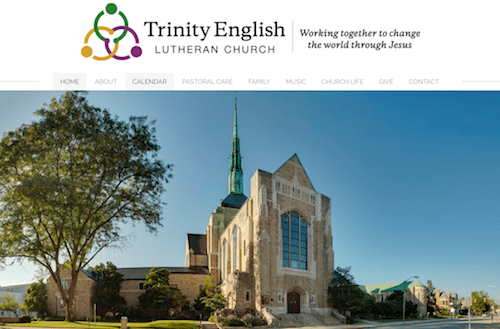 Located in downtown Fort Wayne, Indiana, Trinity English Lutheran Church works to be an active part of the community and welcomes everyone. They also provide a space for caregivers of family members with Alzheimer’s disease or related dementia to gather in a support group once a month, on the second Thursday of the month, at 10 am. 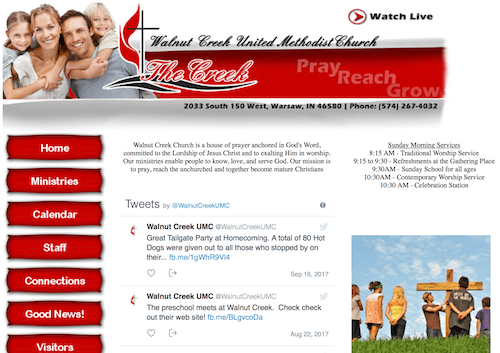 Walnut Creek United Methodist Church pursues ministries that help people come to know, love, and serve God. They also open their doors and host an Alzheimer’s caregiver support group the second Thursday of each month at 10 am. This group meets at 2033 S 150 W, at the corner of IN 15 and 200 S and is affiliated with the Greater Indiana Chapter of the Alzheimer’s Association. 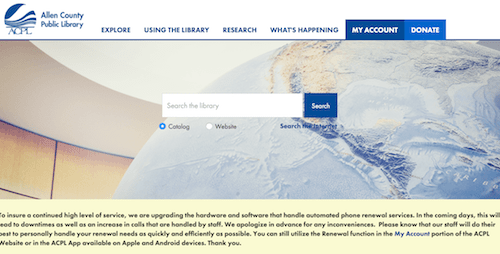 The Allen Country Public Library (ACPL) is a service institution seeking to inform, educate, entertain, and enrich the community by providing books and other materials, facilities, and professional services free of charge to all residents. The ACPL has 14 locations, and the Waynedale location remains true to the library’s overall mission of informing and educating the community by hosting a support group for caregivers of people with Alzheimer’s disease or a related form of dementia. The group meets on the first Thursday of every month at 10 am. 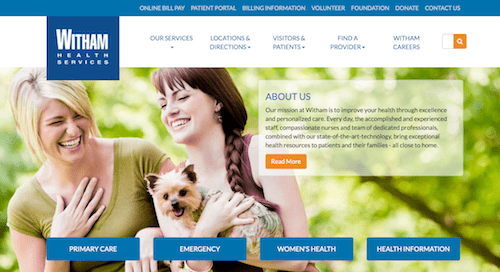 Witham Health is a non-profit hospital and physician network in Boone County, Indiana, that strives to bring outstanding health resources to patients and their families in Lebanon and the surrounding communities. One of the resources they provide is hosting a caregiver support group for caregivers, family members, and friends of people living with Alzheimer’s disease or a related dementia. You can plan to receive emotional support, problem-solving strategies, and the latest research information when you attend this support group. Witham Health Services Alzheimer’s support group is free of charge, does not require any registration, and insists on confidentiality of meetings. Please note, this Alzheimer’s support group meets in the VIP Dining Room.